save 10% on the individual retail price! Our award winning Revive Elixir and Super Nourishing Face Balm are the perfect partners for a fuss free day and night skin care regime. The Elixir absorbs quickly for a great "plump, tone and smooth" base under makeup in the mornings and the Balm encourages collagen production and nourishes your skin beautifully over night. Revive Elixir 15ml / 0.51 fl.oz. If you feel your skin needs an extra dose of oomph, pamper and glow, no matter what skin type you are, then look no further! Super Nourishing Face Balm - 30ml / 1.014 fl.oz. 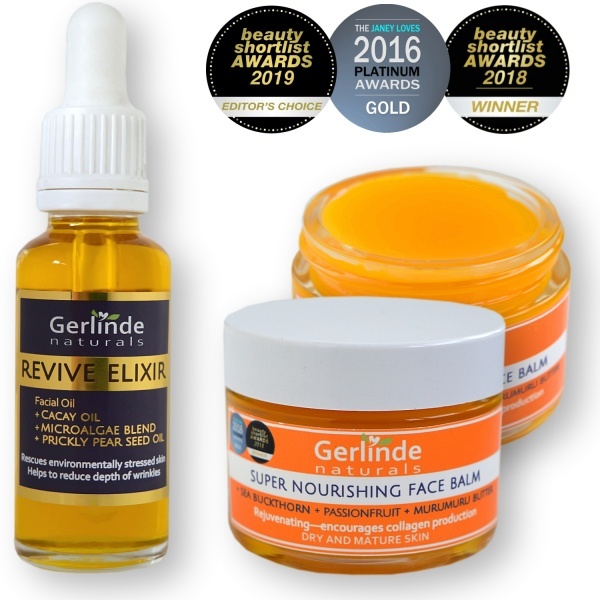 Our soft golden, award winning Face Balm is bursting with powerful botanicals and provides you with all the nutrients your skin will need; it traps plenty of moisture, protects your skin from the elements and still allows your skin to breathe. The wonderfully nourishing ingredients in this Face Balm are known for their benefits on dry and mature skin, including vitamins, minerals A, B, C, E and high linoleic, oleic acid content, Omega 6 plus Omega 9 which help your skin to look more refreshed, well moisturised, soft and healthy. The Butters and Oils contain lots of phytosterol which encourages collagen production, plumping up the skin, and can help with skin tissue regeneration. The ingredients are also wonderful for scaly skin and skin toning.